Working another trade. 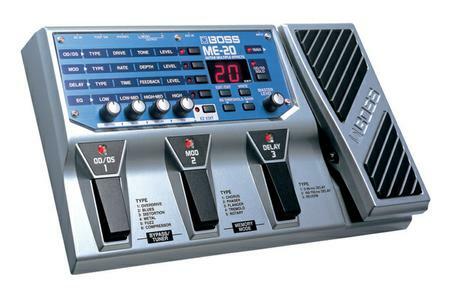 Does anyone have any experience with the Boss ME-20 effects pedal? If so, what did you think? I looked at that pedal real hard before ultimately deciding on the Digitech BP355. I think the BOSS is the better board, but the Digitech offered more for less money. I guess it all depends on what effects you like to use. While the boards do seem overly complicated at first, you can configure them to bank effects that you know you're going to use in a set. So far, I've customized only a couple of effects that I like that I can assign to each of the pedals. I can also turn on/off distortion, chorus, reverb simply by pressing any of the three pedals as default. I'd say if you use more than a couple of effects and are constantly changing your effects between songs, then what Marko describes makes more sense. If you keep things simple, a multi-effects board like this or the Digitech I have can be useful as well.